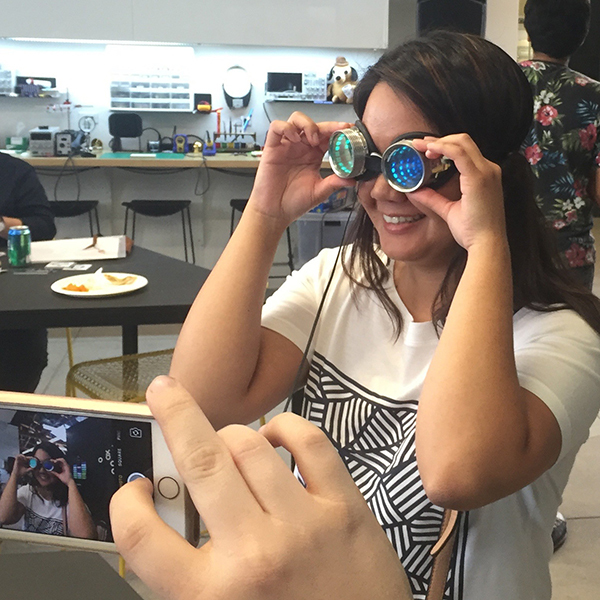 A few weeks ago, we took Hackaday IRL and into hackerspaces around the globe. This was World Create Day, a community effort to come together and build something that matters. Think of it as the pre-game for the Hackaday Prize, our online competition to change the world by building hardware. The groups at these hacker meetups have sent in pictures and reported on what they created. What happened during this worldwide hacker meetup? So much awesome stuff. Did you know Hackaday has its own Hackerspace? It’s true! We have an eight-foot ShopBot, a Tormach, we just got a rig to do injection molding, and apparently, the intern is busy setting up a resin printer. There are a ton of really talented people associated with the Design Lab, and they were out in full force on World Create Day. [Diego] from Deezmaker has been working on robot muscles and customizable linear actuators for a while, so that was obviously the focus of his World Create Day. Everyone needs mirrored LED-equipped welding/steampunk goggles, so that was [Rich Cameron]’s build, pictured to the right. 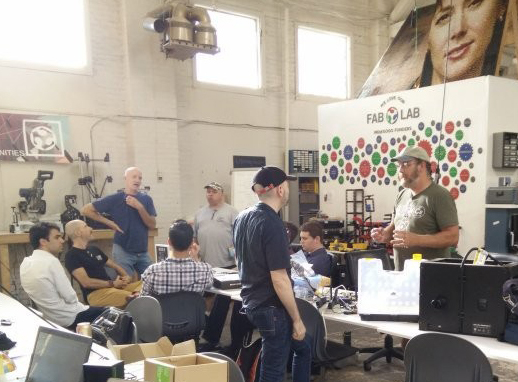 A fabulous time was had by all, but just because this was only one of three World Create Day meetups hosted ‘officially’ by Hackaday doesn’t mean it was the biggest or the best. There was plenty of fun the world over. World Create Day is a worldwide event, so of course we had a few events in the second most populous country on Earth. [Inderpreet], [Shubham], [Simrat], and [Navjeet] put together a World Create Day event at the Department of Electronics Technology at GNDU Amritsar, their local university. A slew of people showed up, [Inderpreet] gave a talk on The Hackaday Prize, and much fun was had by all. The Fab Lab in San Diego also hosted a World Create Day event, Projects that made the cut included a real time, IRL closed captioning device. Think of this one as a universal translator, but only one language, with a screen. Or a voice to text thing running on a phone. Either way. Other ideas included an improved mobility cart, an underwater autonomous robot, wireless communication nodes, pressurized algae incubators, and a whole bunch more. The folks at the San Diego Fab Lab also produced a short video of their World Create Day activities, you can check that out below. Right now we’re throwing a two-day hackathon in Pasadena. As with all hackathons, people are going to build something, but that’s only going to happen today. Yesterday was an incredible Zero to Product talk that goes over PCB layout techniques, manufacturing, and schematic capture. In a seven hour talk, our own [Matt Berggren] took the audience through building a product, in this case a little ESP8266 breakout board. We livestreamed this; the video (and electric pickles) are below. Right now we’re throwing a huge workshop, meetup, and hackathon in Pasadena. Events include a ‘Zero to Product’ workshop that will take everyone through PCB design, manufacturing techniques, CAM, soldering, testing, and blowing up caps and releasing blue smoke. You can check out the live stream of that here (or below). Later on this evening, we’ll be having a few short talks from some LA-area hackers, builders and engineers. Tomorrow is Open Hack Day, where the Hackaday Design Lab will have tables filled with components, dev boards, soldering irons, and enough blinkey stuff to blind someone. Live stream below.